The rain and snow held off but the temperatures took a nose dive towards winter instead of spring. 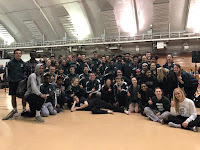 The boys & girls of the Madison Memorial Track & Field team just bundled up and went to work taking care of business against their opponent Tuesday night. This is the time of year when our bodies ache, our muscles are sore, and we are all on the verge of injury. It is important that we get SLEEP, that we ICE and STRETCH, and that we drink WATER. After next week, we begin championship season and things will get easier, times will get faster, distances will become farther, and heights will get higher BUT we need to be healthy to compete in these meets. It is only 3 weeks until conference!!!! It doesn't feel like it because of the weather but it will be here soon...stay positive, dream of sunny track & field meets, and be ready to compete at your best. Tuesday night saw the boys and girls teams extend their dual meet winning streaks. We use these meets as workouts and stepping stones but it never hurts to enjoy a victory. The girls scored 93 points to Beloit Memorial's 43 points and the boys totaled 97 points to Beloit Memorial's 49 points. There is still room for improvement but many things went well tonight. Keep up the good work. Earning victories on the girls side were: Natalie S in the 100m hurdles (17.75), Marissa H in the 100m dash (13.03), 200m dash (27.24) and high jump (4' 8"), Robyn B in the Long Jump (13' 11"), Sienna C in the 1600m run (5:39.96), Gabrielle G in the 300m hurdles (54.48), Sara N in the 800m run (2:38.0), Samantha G in the 3200m run (13:49.0), Corinne F in the discus (137' 1") and the 4x400m relay (4:31.48). On the boys side it was: The 4x800m relay (9:44.0), Zach O in the pole vault (7'0"), Jason W in the 100m dash (11.57), Micah P in the triple jump (41' 9") and long jump (20' 5"), James A in the 1600m run (4:50.53), Jester W in the 400m dash (54.68), Nick M in the 300m hurdles (42.04), Jared B in the high jump (5' 4"), Bryce H in the 800m run (2:16.41), Ryan B in the discus (127' 8"), Jeremy G in the shot put (42' 8 1/2") and the 4x400m relay team. We encourage kids to keep up the great work in the classroom, at practice, and in the meets. This is the time of year that these things will start paying off. It is a busy time of year so please make sure you communicate with the coaches and we are ready to compete. Let's finish the next three weeks on a high note and send our varsity kids into the WIAA run performing at our best.